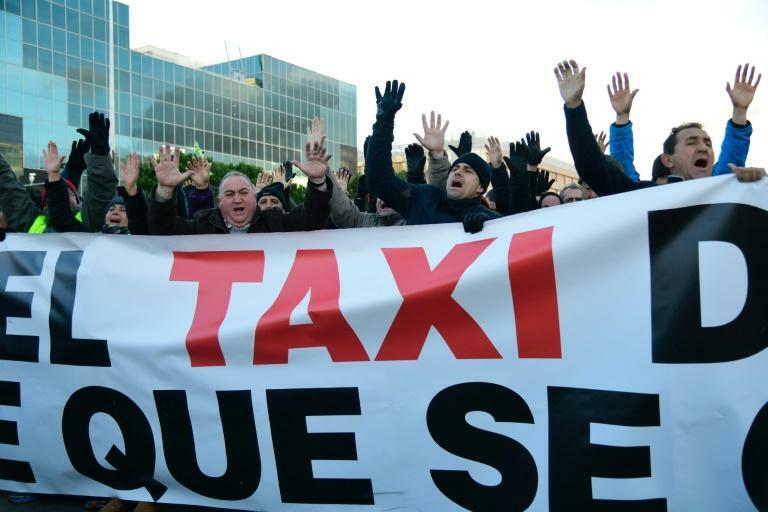 A taxi strike against Uber-like services in Madrid entered its third day Wednesday just as one of the world's biggest tourism fairs opened, with hundreds of drivers protesting at the convention centre. The taxi drivers blocked the road in front of the centre where the Fitur fair kicked off, burning tyres and a dustbin. They had painted the slogan "VTCs aren't taxis" on the asphalt, referring to tourism vehicles with chauffeur such as Uber or Cabify, and shouted "Yes we can" and "Taxis united will never be defeated". Juan Manuel Rodriguez, a 44-year-old taxi driver, was wearing a yellow vest like others around him in solidarity with anti-government protesters in neighbouring France. "They're fighting for what they believe is fair and we are too," he said. Taxi drivers are also striking in Barcelona amid increasing tensions with ride-hailing services which they accuse of taking away their business. In Madrid, a taxi driver was seriously injured on Tuesday after jumping onto the bonnet of a black vehicle thought to be a VTC during a protest, and falling back onto the road as the car sped off. Emergency services said the man, in his thirties, suffered a brain injury and a spokeswoman for Madrid's La Paz hospital said he was "in very serious condition". Spanish taxi drivers complain that rivals from ride-hailing apps compete unfairly since they do not face the same regulations and costs. They want authorities to better regulate the number of VTCs on the road. In an attempt to stem the use of VTCs, the government of the northeastern region of Catalonia unveiled new regulations on Friday obliging Uber or Cabify customers to book their services 15 minutes in advance. That means these customers would have to wait 15 minutes before they can get a ride. But taxi drivers said this wasn't enough, arguing that ride-hailing services are not a taxi service by law and should therefore be booked 12 to 24 hours ahead of time. On Tuesday, after meeting with taxi representatives, the regional government said it would allow local authorities such as city halls in Catalonia -- if they deemed it necessary -- to lengthen that pre-booking time "to a maximum of one hour", a spokeswoman said. Unauto VTC said this "entails the disappearance in Catalonia of the VTC sector" with the subsequent "destruction of more than 3,000 jobs."